Thank you for giving the public the opportunity to weigh in on the subject of parking in our city. I offer my comments here on my own, as a Roslindale resident, and also on behalf of WalkUP Roslindale, a collaborative community group with hundreds of supporters founded in May of 2015 that takes its name from the growing movement to foster and improve “Walkable Urban Places.” Our goal is to make Roslindale the most walkable neighborhood in Boston. Reduce or eliminate minimum parking requirements for new development – This will help keep housing more affordable, reduce commercial rents, and reflect the true demand for parking. Where parking is required to be provided, we would advocate for de-coupling the parking provided from individual users. For example, in an apartment building, the residents of one unit could rent two spaces, while the residents of another unit might rent none. Implement residential parking permits citywide – To mitigate concerns about overflow impacts from residents not paying for on-site parking spaces turning to nearby on-street, free parking, we would advocate for neighborhood-based residential parking permits. 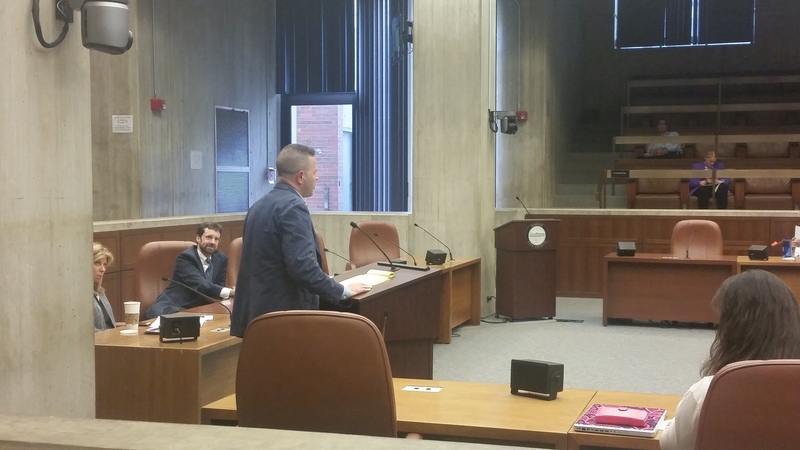 We would further support implementing an approach that would prevent residents of new developments that have decoupled or eliminated off-street parking from obtaining residential parking permits. Price residential parking permits by demand for each neighborhood – Currently, residential parking permits are free throughout the city. We believe the city should consider implementing a baseline user fee for the first one or two residential parking permits, with the possibility for increasing the user fee based on location (higher user fees in downtown areas where parking is at a premium) or number of permits obtained. Consider charging for parking in commercial districts outside of downtown – Most of Boston’s neighborhood commercial districts, and certainly ours in Roslindale, have free parking, sometimes subject to generous (and rarely enforced) time limits like 2 hours. Charging for parking, even at relatively low rates such as a quarter per hour or every 30 minutes, would encourage a higher rate of turnover and increase the effective supply of available parking without having to build new spaces. While we recognize that different stakeholders will view such a conversation and possible policy differently, we urge that this be given consideration in an open and inclusive process in those districts where an interest is expressed. For the record, we would like to express our interest in working with the city on such an approach in our own neighborhood’s main commercial district. As matters now stand, the Roslindale Village MBTA commuter rail lots, which charge a modest fee for daily parking, are virtually never full, and personal observation suggests many drivers park in on-street spots near those lots to avoid the fees. Similarly, even the free municipal lot (off of Taft Hill Terrace in the village) rarely if ever fills up during the day, even though the entire commercial district in Roslindale is within a five-minute walk of that lot. Furthermore, a 2010 Tufts Urban Environmental Policy Planning study of Roslindale Village, available online at http://www.roslindale.net/pdfs/TuftsFinalReport.pdf, found that managing parking supply in Roslindale (including by charging for spaces in the business district), would provide widespread benefits to both neighborhood residents and businesses. Create more loading, drop-off, and pick-up zones in commercial districts, both downtown and in the neighborhoods – Double parking is a citywide issue with delivery trucks and Uber/Lyft drivers occupying vehicle travel lanes, crosswalks, bike lanes, and even sidewalks. Repurposing a limited number of on-street parking spaces in this way could have tremendous upside benefits. Institute alternating parking along busy bus corridors during peak hours to create part-time bus and bike lanes – We think this approach could have incredible benefits right in our neighborhood – in the Washington Street corridor from Roslindale Square to Forest Hills. Bus ridership is substantial in this corridor and operations could be greatly improved by having a dedicated lane inbound in the morning and outbound in the afternoon. Return parking revenue from meters and residential permits to the neighborhoods in which they are collected – We know that our neighbors and business and property owners in Roslindale would be intensely interested in where revenue generated from parking meters and permits was invested. We suspect this viewpoint would be shared throughout the city. We are sure each neighborhood could arrive at the appropriate mix of improvements to be funded through this new revenue source. We believe it would be particularly appropriate to invest locally-generated parking revenue in local improvements to active transportation infrastructure, thus creating a “virtuous circle” that will help move our city away from focusing on accommodating single occupant vehicles on our streets, as we must to integrate the expected growth in population over the coming decades and do our part, as a major coastal city, in mitigating the effects of climate change and sea level rise. In closing, we believe it is critical that these sorts of solutions to the city’s parking concerns be implemented in a broader context of integrated land use and transportation planning. Overemphasis on parking supply is just one manifestation of a lack of priority and funding for alternatives to driving. We recognize that all of us may need to drive at various times for a wide variety of reasons ranging from disability to profession to lack of viable alternatives, but there are many cases where we expect many more of us would enthusiastically commit to use a greater mix of public and active transportation were the city to provide adequate support to do so. If we make it easier for people to travel to, from, and around our city by alternative means, this will have a far greater positive impact on parking issues than any solution that focuses on parking in isolation. Again, we thank you for the opportunity to comment on this important subject. As part of ImagineBoston 2030, the ongoing citywide, once-in-a-generation planning effort, Mayor Walsh recently recommended a wide-ranging reading list of books to consider reading to prepare ourselves to contribute. Among those books is Jeff Speck’s Walkable City. The chapter in that book that has perhaps generated the most discussion has been “Get the Parking Right” – a chapter in which Speck synthesizes and makes understandable a great wealth of data and research about vehicle parking and how cities and towns, including Boston, can better manage it to become more walkable, bikeable, and livable. We strongly encourage the committee’s members to read the chapter and, with the author’s permission, have attached a copy to this letter. Thank you again for your work on behalf of our city.